7 Reasons Why Kiwis Are So Good For You! This delicious fruit may be small, but don't let its size fool you - kiwis are packed with numerous health benefits. Take a look at the nutritious benefits of kiwis alongside some fantastic tips on how to select and use them too. • If purchasing kiwis to eat that day, or soon after, they should yield to a bit of finger pressure. If they are slightly harder, kiwis can be ripened by storing them at room temperature, away from the sun. • To quicken the ripening, store your kiwi in a paper bag along with a banana, apple or pear. • Once the kiwi is ripe enough to eat, keep it away from other fruit or store it in the fridge. Kiwi is very sensitive to the ethylene gas given off by other fruits, causing it to over ripen. Just two medium kiwis contain 230 percent of the recommended daily allowance of vitamin C - almost twice the amount of an orange. Vitamin C is essential for the body as it helps boost the immune system, as well as fight stress and aging. Vitamin C also promotes wound healing, helps iron absorption and promotes healthy bones, blood vessels and teeth. Kiwis are also a good source of vitamin E - a potent antioxidant that helps lower cholesterol and boost immunity. Kiwis contain a hormone called serotonin which is connected with digestive and cardiovascular functions. Serotonin boosts learning, memory and mood and helps regulate your appetite. This hormone is also responsible for falling and staying asleep. At the same time, serotonin is also responsible for keeping you alert in the morning. Kiwis contain 30mg of magnesium - a crucial mineral that promotes nerve and muscle function, Magnesium will also help boost your energy levels. 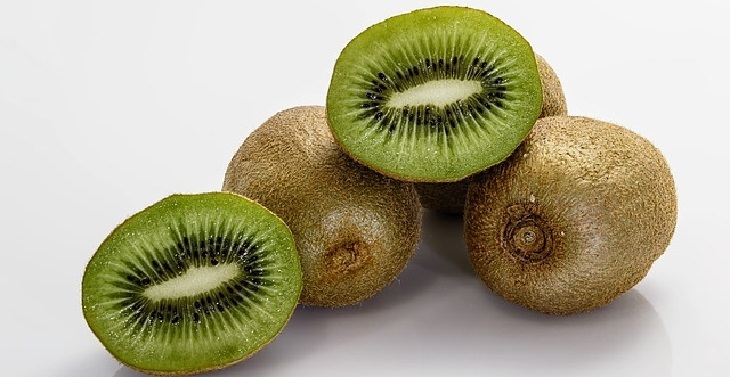 The kiwi also contains more potassium than a banana - an essential mineral that helps manage blood pressure, along with a decreased risk of kidney stones, osteoporosis and stroke. The average adult takes over 20,000 breaths each day - that's a lot of work for your respiratory system. But, research indicates that kiwis may help lighten the load on your lungs. In one study, children who ate five to seven servings of kiwi or other citrus fruits per week experienced less wheezing that those who ate less than one serving per week. It was also noted that shortness of breath was reduced, as was severe wheezing and nighttime coughing. Kiwis contain a chemical called phytochemical lutein, which according to some studies can prevent age-related blindness. Lutein can also protect the eyes from different kinds of free radical damage. However, the body is unable to synthesize lutein, so it is therefore especially important to get plenty of foods that contain this chemical, and one way to go about it is to include a handful of kiwis into your daily diet. Besides being fat-free, two servings of kiwi contains more fiber than most bran cereal. They are also a good option for people who need to manage their blood sugar - those that have a glycemic index of only 52. Kiwis are also a fresh and delicious way to maintain heart health, regulate digestion and manage cholesterol. Eating two to three kiwis per day has shown to reduce blood clotting by 18 percent. They can also reduce triglycerides by 15 percent. One way to go about reducing blood clotting is to take aspirin. However, for a more natural alternative, kiwi has the same anti-clotting benefits with no side effects - and as you can see above, additional health benefits. 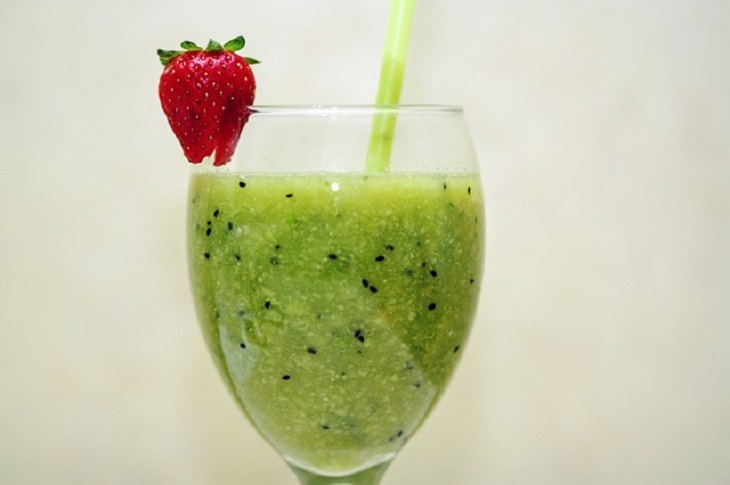 Simply add all the ingredients together into a blender and blend until smooth.